The BMW 3 Series coupe established itself as the default choice as the premium compact coupe of choice in the nineties. Mercedes were slow to respond, not launching the rival CLK model until 1997 and Audi's Coupe never really overcame the wholesale indignation of the fact that it pointedly wasn't an Audi Quattro. This left the field clear for BMW to clean up and during its lifespan it developed the E36 series Coupe to a finely honed excellence. Used examples are plentiful, but you'll need to be on your toes if you want to avoid the rogues. Prices have fallen to levels where the cars are getting into the hands of those who can't afford to maintain them, so shop with care. The E36 series BMW 3 Series was quite a shock to the system, replacing as it did the resolutely square E30 generation cars in Spring 1991. 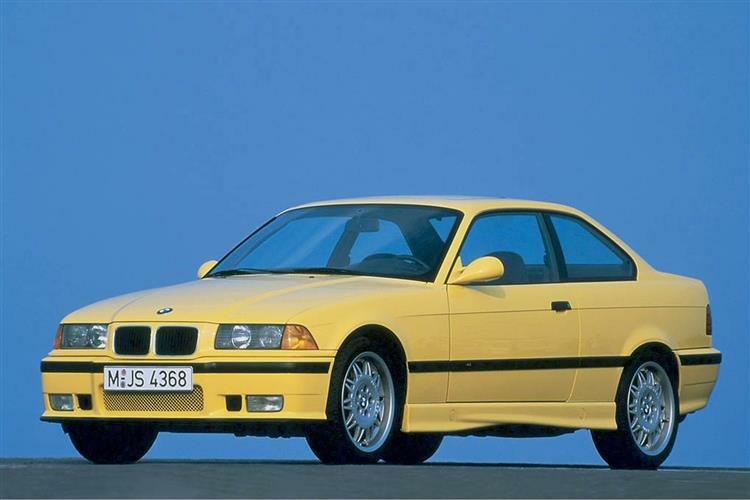 With sleeker styling and a slicker interior, the E36 offered a more refined touring bias than the rather rorty E30 models and it was an instant hit, offering subtler appeal to match the mood of the early nineties. At first, only saloon models were offered, but the coupe variants appeared in January 1992 with four-cylinder 318iS and six-cylinder 320i and 325i derivatives on the books. An entry-level 316i four-cylinder variant followed that summer. The 16v 1.8-litre unit was more potent than the 8v engine used in the Saloon - hence the S designation after 318i. A flagship 3.0-litre Motorsport-tuned M3 flagship followed in early 1993, followed by an ultra-rare M3 GT homologation special. An entry-level 316i version was launched in early 1994 while March 1995 saw the launch of a slightly revised 2.0-litre six-cylinder petrol engine for the 320i variant and an all-new 2.8-litre six-cylinder petrol unit for the 328i flagship, replacing the 325i Coupe. 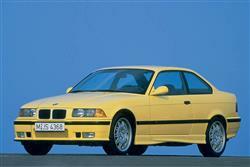 At the same time the Coupe range was boosted with a 323i derivative that replaced the previous 320i. Contrary to its name, this had a 2.5-litre six-cylinder petrol unit. From January 1996, all the M3 Evolution was launched, with a 3.2-litre six-cylinder engine with double-VANOS valves and 321bhp. Anti-lock brakes were standardised on all models in 1992 and, airbags arrived as standard fare from September 1993. Catalysts were part of the recipe since the car was first introduced in 1992 along with a range of safety features that have earned the marque the respect of its customers. All models got a minor makeover in September 1997 that included equipment upgrades and subtly different front end treatment. The E36 Coupe models were sold alongside the next generation E46 saloon models for a while until they too were replaced in May 1999. One complaint those who aren't fans of the 3 Series Coupe level at the car is that it doesn't look signally different from the saloon model albeit with two less doors. Flip that argument on its head and you'll appreciate that the car offers almost saloon-like levels of space with none of the claustrophobia associated with many more compact coupes. True, some of the lower specification cars can look a little dowdy but a nicely appointed E36 Coupe still looks a smart number. The interiors show the clean attention to detail that barely dates and the build quality is very good. The M3 models are still highly sought after and on a performance per pound basis you can't buy better. It's just a shame that BMW never had the foresight to put one of their excellent diesel engines into a Coupe or offer some scorching all-wheel drive variants. The E36-shape 3 series has established an impressive reputation in the trade - and not only because its digital odometer is nearly impossible to clock. High demand has meant that second and third-year depreciation levels are still considerably lower than more 'ordinary' models from mainstream makers. In other words, when resale time comes, you should get a lot more for your part exchange than you might expect. Watch for loose or ill-fitting interior trim and cold starting problems on earlier models and there have also been reports of water leaks through window seals, and coolant seepage from radiators. Be careful when considering South African-built cars (all 318iS saloons and some 316i/318i saloons) as the trade talks of sub-standard build quality and reliability with some of these. The 328i is often a model to steer clear of. It was plagued by problems with its Nikasil cylinder liners and this often resulted in new engine warranty claims. The flipside of this is that there may well be some very well looked after low mileage 328i models with replacement engines that would make a great buy. The M3 models are specialist pieces of kit, as would be expected with a car that boasts what is effectively half a McLaren F1 engine. As time passes by, many are reflecting on quite what a great car the original 3.0-litre is, boasting a powerplant that's a good deal less temperamental than the BI-VANOS unit fitted to the 3.2-litre Evolution. Track sown one of the rare right-hand drive M3 GT models and you have a proper performance con amongst BMW cognoscenti. M3 Evolution models are relatively plentiful but ensure the car hasn't been overly customised. Estoril Blue remains the favoured colour. Watch for cars which have had many owners (this could be a sign of ongoing problems). Insist on a full service history, ideally with BMW dealer stamps. If you really want piece of mind, buy from a franchised dealer - but be prepared to pay a premium. Settle behind the wheel and it will feel good to be at the helm of a Three series thanks to the solid, quality feel of the controls and the silky-smooth performance. One of the advantages of buying a well cared for example is that the engine should be nicely run-in, so you can enjoy all the performance right from the start. In the six-cylinder petrol-powered 325i for example, there's plenty on offer. Rest to 60 takes just 7.3 seconds on the way to a maximum of over 140mph. The M3 is supercar quick, an Evolution hitting 60mph in 5.2 seconds and running on to a top speed limited to 155mph. The 3.0-litre M3 GT model had an unlimited top end and find a clear stretch of autobahn and you'll see 170mph in one of these cars. The E36 generation BMW 3 Series Coupes has a quite a few highs, the odd low and a whole heap of appeal. There are some rough examples around and buying a well serviced car that's been kept as close to standard trim as possible is a wise move. The best picks are the 318iS and the M3 but a nicely looked after 325i makes a very sweet cruiser. Take your time, look at a few and don't be afraid to walk away. If you're prepared to pay the right money for the right car, you won't be disappointed.